True story: a few years back, when my wife and I got married, it was decided–probably by her–that we needed some sort of “promotional item” for our nuptials. Personally, I think an open bar and a piece of cake should suffice, but–just like at an American baseball game–some sort of toy seems necessary these days to mark the occasion. Rather than play the grump, I tried to get into the spirit of it, and we came up with rainbow colored Slinkys, printed with our names and the date. In their own little boxes, of course, so that everyone would have something to open. Remarkably, when visiting friends or relatives who had been at the wedding, the Slinkys can be seen on bookshelves or desks in their homes. “You still have the Slinky!” I’ll say. “Love the Slinky,” is the stock reply. All of which goes to prove that the humble Slinky might be the greatest promotional item of all time. Which might be surprising, since–unlike many promotional items–the Slinky has almost no utilitarian use at all. It is what might be called a “pure toy.” Which might have something to do with its popularity. Let’s face it, by this time in the game, everyone’s seen the refrigerator magnet with your name on it, or the imprinted stack of post-its, the battery powered personal fan, and the rest. But if you want to see someone’s face light up, hand them a Slinky. I’ve gotten a similar reaction from Pez, the little plastic candy containers in various disguises–the Santa Claus Pez sits on my desk–but even there, someone is getting a piece of candy. You might be able to get the Slinky to walk down the stairs, but other than that trick, mostly what the Slinky does is sit in your hands as you watch the coils go this way and that. Fascinating. The Slinky may not be able to do much, but then again it makes few demands. It doesn’t need to be updated, doesn’t require a password, and it doesn’t require you to do something else first to play with it. It’s pure entertainment. The Slinky was invented by a naval engineer in the 1940s and first demonstrated at a Philadelphia department store in 1945. The first production run of 400 sold out in 90 minutes. Soon, Slinkys began turning up in classrooms as teaching tools–gravity, don’t you know. It’s also been used as a radio antenna, and in NASA physics experiments. But, most people who receive a Slinky will just start playing with it in their own way. 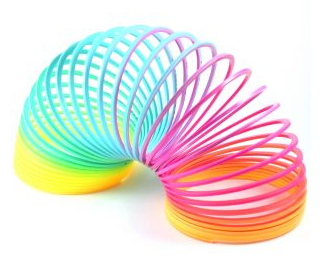 So, if you’re looking for a promotional item that has almost zero utility, but will amuse its recipients by letting them be children for a few minutes, and will probably hang around the house for years, give ‘em a Slinky.